Have you ever wondered what happens when sailors at sea have a fire on ship or inside their submarine? I’m sure it isn’t pretty, but what if they had a fire fighting robot? Well, it seems that now they do. It’s called SAFFiR. 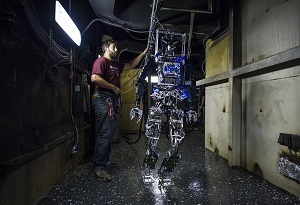 SAFFiR is an acronym that stands for Shipboard Autonomous Firefighting Robot. It’s a human-sized robot capable of locating fires on naval vessels and then suppressing them before they get out of control. They can work alongside human firefighters to put out a dangerous inferno before it does too much damage (1). The robot is shaped like a humanoid, which ought to tempt its human counterparts to give it a real name, like “Bob”. Since it is bipedal, it walks around on two legs and is capable of moving in any direction. It can also balance on its legs in sea state operations (that is, while the ship is bouncing between waves), and it even maneuvers around obstacles. It has nozzles for spraying fire suppressant when necessary. It can also use existing thermal shielding equipment. And it contains linear actuators to keep it goal-oriented. With these characteristics, SAFFiR can detect fires, monitor its environment for hazardous threats, and is keenly aware of its situation. SAFFiR can also withstand high heat conditions for long periods of time, which makes it very formidable against big fires. It can respond to human gestures and commands. The Navy has an innovate new program called Damage Control Technologies for the 21st Century (DC-21) (2). DC-21 will help the Navy manage damage control of onboard fires by utilizing smart sensors that alert crew and shipboard leaders when it detects gases and incipient fires. The program also utilizes “microflyers” that respond rapidly to a situation and map fires and damage in 3-D. 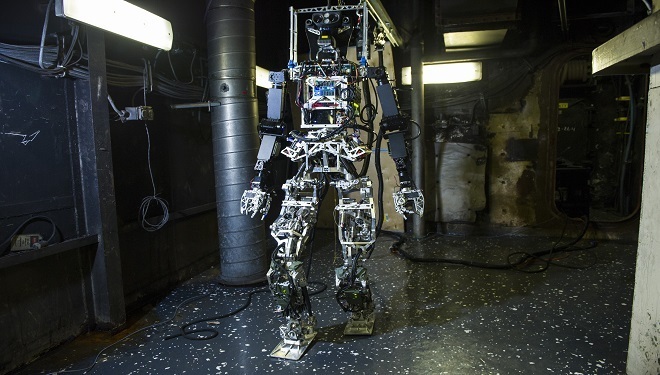 The program provides fire suppression technology suitable for SAFFiR’s deployment, and one of the most impressive parts of the technology is the human-robot interaction through hand gestures and natural language dialogue. Of course, there are challenges to overcome with SAFFiR. Researchers are still struggling with how to make SAFFiR handle and manipulate human tools and maneuver more gracefully. There is also the issue of robot component hardening in the face of heat resistance. The Navy hopes to be able to take SAFFiR beyond normal human control to a more complex and sophisticated control level with regard to maneuvering and human supervisory control. Also, fire suppression techniques tailored specifically for robotic systems is an area of research with more opportunities to explore. Is SAFFiR the Future of Naval Shipboard Firefighting? Is this going to be the Navy’s future firefighting force? Currently, SAFFiR is designed to interact with human firefighters and follow their commands. Will there ever come a day when robots will command humans while fighting fires on naval vessels or perhaps operate solely as a robot team without human interaction? That remains to be seen, but anything is possible.